Federal investment of $5.25 million in three University of Saskatchewan (USask) research centres will help protect Canadians against infectious disease, produce and deliver medical isotopes to hospitals using non-reactor nuclear technology, and help conserve water and energy by advancing green roof technology for cold climates. The funding from Western Economic Diversification Canada was announced by Canada’s Public Safety and Emergency Preparedness Minister Ralph Goodale in Regina today. Vaccine and Infectious Disease Organization—International Vaccine Centre (VIDO-InterVac) was awarded $3.6 million to establish a manufacturing facility to produce vaccines and other biologics—products made from living sources—to protect against human and animal infectious diseases. Creation of the facility will enable the production of biologics for clinical studies and manufacture of animal vaccines. The project will receive other public and private sector funding. “This facility will amplify Canada’s innovation and science strengths, advance the country’s ability to cope with current and emerging infectious diseases, and serve as a valuable resource to innovators seeking to bring novel biologics to market,” said Andrew Potter, director and CEO of VIDO-InterVac. Canadian Light Source (CLS) was awarded $1 million to further develop new technology to supply medical isotopes using the synchrotron’s linear accelerator for production. “This is an exciting opportunity to advance medical isotopes production technology in a cleaner and safer way, without the use of a nuclear reactor,” said CLS director Rob Lamb. This innovative technology is being developed to produce radioisotopes that yield technetium-99, the imaging agent used in 5,500 diagnostic imaging procedures daily in Canada. CLS has commissioned the design and construction of a prototype generator that eventually will be placed at radiopharmacies in Canada. Saskatchewan Centre for Cyclotron Sciences (SCCS), operated by the Fedoruk Centre at the U of S, will support testing of the new generator. SCCS already delivers another nuclear imaging agent routinely to regional hospitals for cancer diagnosis, and has experience with quality assurance that will need to be considered when advancing the CIIC product toward clinical application. Hydrology professor Jeff McDonnell was awarded $643,702 to establish the Green Roof Environment and EngiNeering (GREEN) facility, with a primary focus on testing green roof systems specifically targeted for cold regions. The GREEN facility will be part of the Global Institute for Water Security (GIWS), where McDonnell is interim director. Creating a healthy space for roof-top vegetation will reduce CO2, improve storm water management in urban areas, and limit roof-surface temperatures. “This facility will enable the university and GIWS to move into the green roof development and technology area,” said McDonnell. 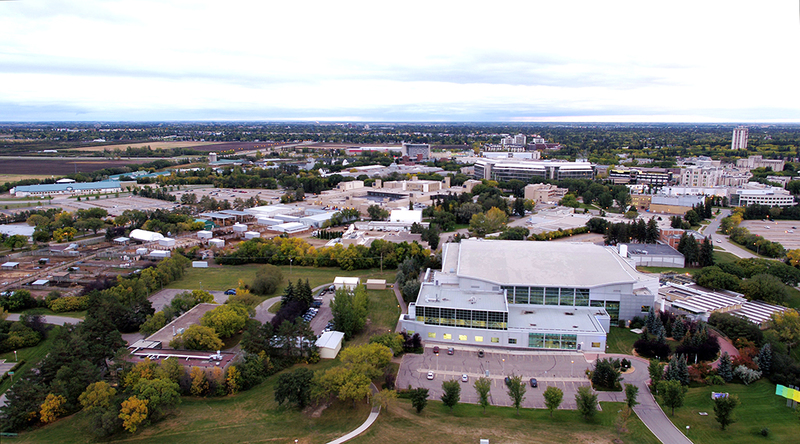 The project will involve a multidisciplinary team of engineers, green roof consultants, and water, soil and plant scientists creating a state-of-the-art facility at the USask to test roof designs for cold regions. Tilt trailers that serve as angled rooftops will be placed in the university’s Mine Overlay Site Testing (MOST) facility at Innovation Place, which can mimic freeze-thaw cycles. The performance of green roof components such as soil substrate mixes, roof membranes, and vegetation will be tested on the trailers under simulated weather conditions for hardiness, storm water retention and other factors. The facility will be a site for basic research and also operate as a fee-for-service test centre for consultants, building owners, civil engineers, plant scientists, green roof systems manufacturers, and architects to test scale-model designs before they are implemented at a site.